The other day, I happened to be near Triangle Town Center and decided to see if any hot dog stands might be close. Indeed there was: Steve’s Place, in Plantation Square an older shopping center between Capital Boulevard and the Mall itself. I decided to give it a try. One of the first things I noticed is that there are a few high tables but no chairs or stools inside. A couple of tables with chairs provide al fresco dining when the weather is nice. I’ve read some complaints about the lack of chairs; but to be honest, hot dogs are usually quickly consumed, and a place to hold your food and drink while you stand and eat really is sufficient. 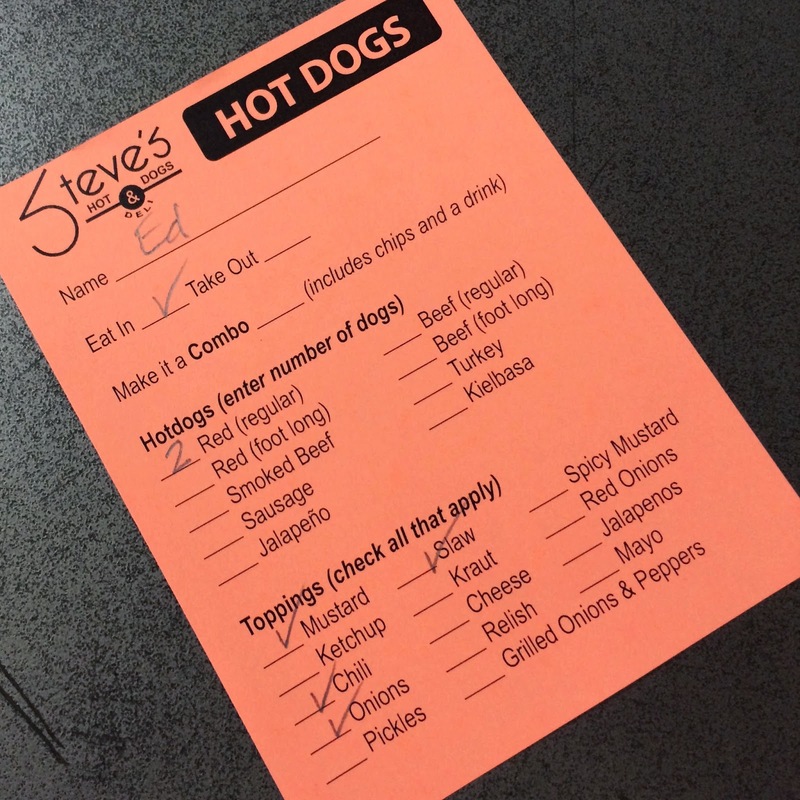 Steve’s offers hot dogs, deli sandwiches, and salads, but I was there for the dogs. Stacks of colored paper caught my eye, and I quickly and correctly surmised that I would order by choosing a sheet from the stack for hot dogs and checking the options I preferred. Traditional red and all beef wieners are the same $2.25, so in the interest of scientific evaluation, I opted for one of each—after initially thinking I’d just try the traditional ones. 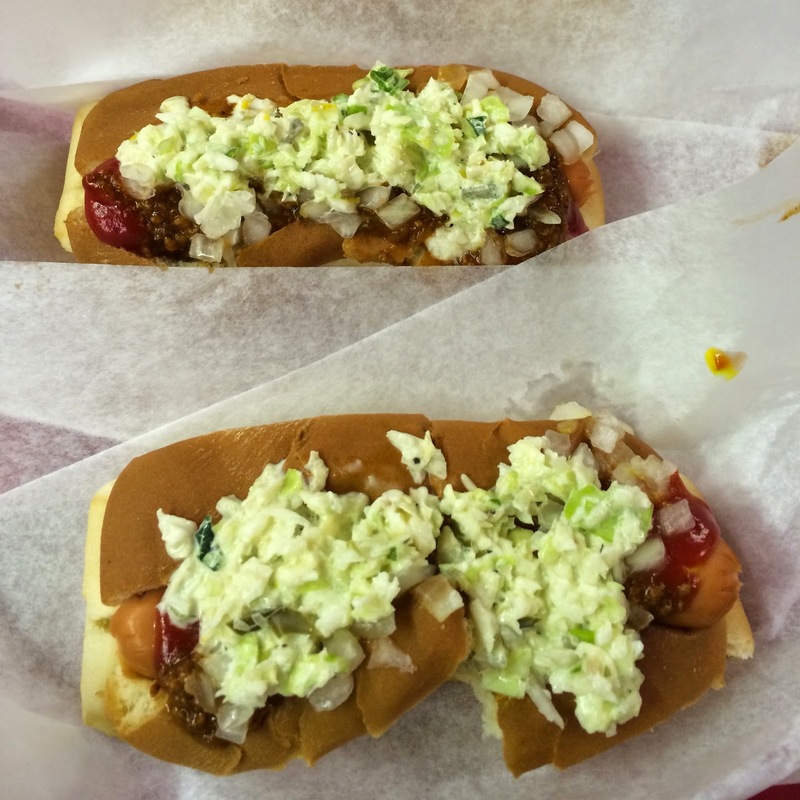 I chose my usual toppings: mustard, slaw, chili, and onions, but they offer several others. 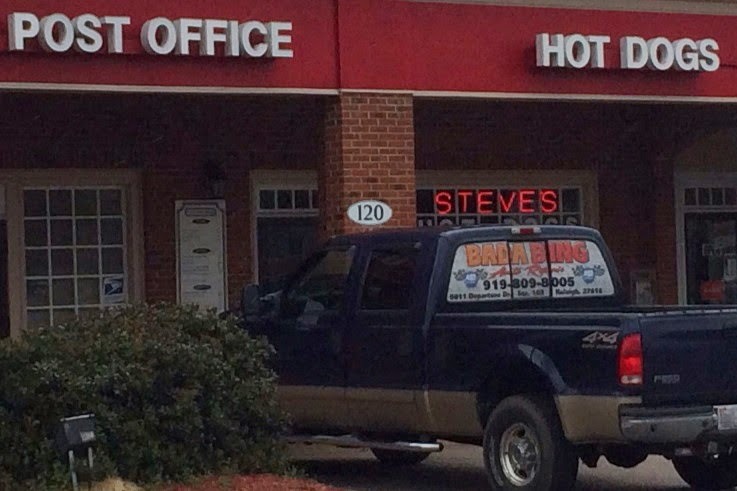 Steve’s also serves several side and dessert items, but I decided to focus specifically on their hot dogs. The service was exceptionally friendly and amazingly quick. I’ve never understood what should take so long to put together a couple of dogs; apparently, Steve’s Place agrees with me. Really. The service was fast and friendly. Within a few seconds, I had two very delightful-looking hot dogs in a plastic basket. Both were pretty good dogs. If forced to choose, I’d probably prefer the beef, just because it did have a touch more flavor. Their slaw is clearly home-made; it’s quite good but perhaps a little too sweet. The onions were subtle players, not sharp as onions can sometimes be, just right. The chili was tasty but not very strong. Perhaps more chili would have made the dogs better. 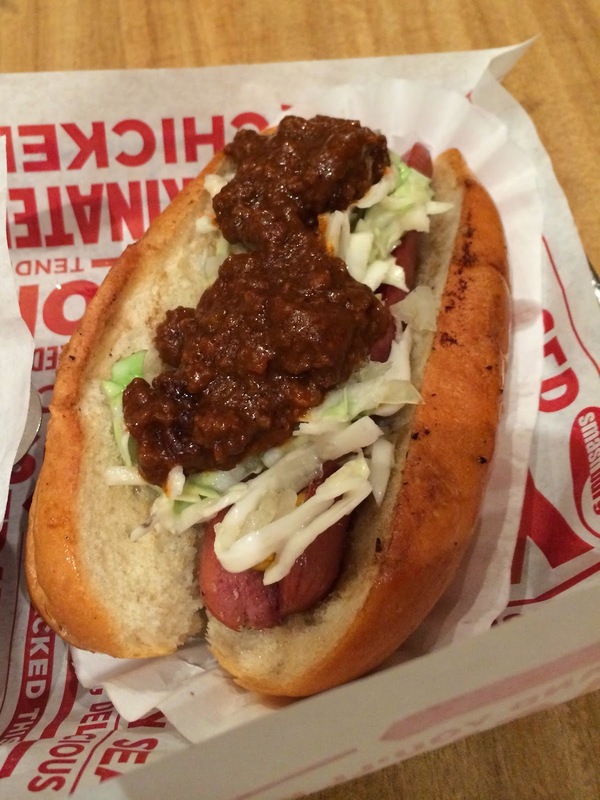 I mainly noticed the chili flavor with bites light on mustard, onions, and slaw. While I don’t like a “hard” chili, this one may have been too soft, so that it was hard to distinguish it from the rest, but again, it seemed to have a nicely flavored spice mix. 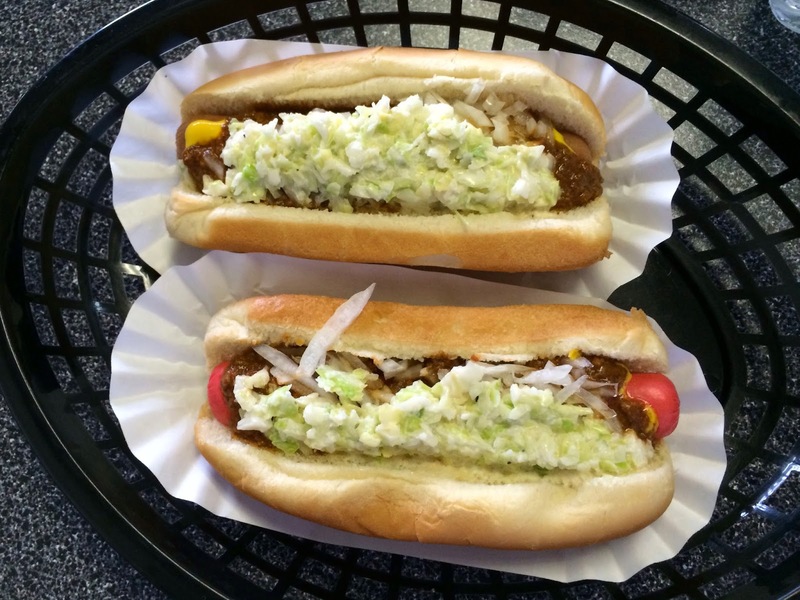 All in all, Steve’s delivers a solid Carolina Hot Dog, worth a try if you’re in the neighborhood but not a destination hot dog worth going out of your way to obtain.